This is an ink I have I got as part of a mass order that I have orgnaised back in January. Bung Box is a stationary shop in Japan and their Bung Box inks are made by Sailor so technically these are all Sailor inks. They can only be purchased directly from Bung Box. They are pricey but they are still much sought after. Dandyism is a little disappointing when I filled it up in my Lamy Logo EF nib. I had expected a dark green with shading but it came out practically black with zero shading. I had expected to see at least a little of the green undertone but no, I see nothing but black. 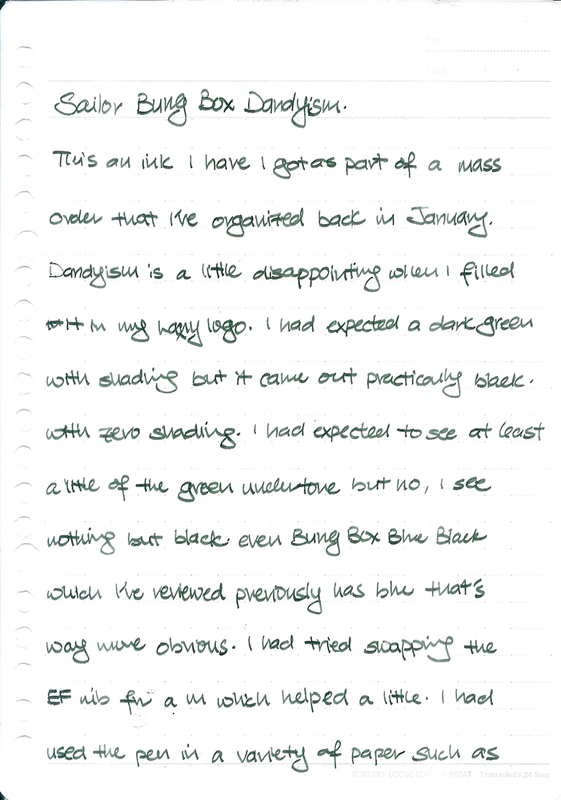 Even Sailor Bung Box Blue Black which I have reviewed previously has blue that's way more obvious. I had tried swapping the EF nib for a M nib. This helped a little. I had used the Lamy Logo M nib on a variety of paper such as Rhodia, Midori, Field Notes and Tomoe River. I found the ink only comes alive in M and bigger nib sizes. When the shading properties can be seen, the shading goes beautifully from a black to a dull matte almost grey green. If the shading had performed better in a narrowed nib size, I'll be a happy trooper. I must say this ink is somewhat of a disappointment when used in a EF or F nib. The dry time is excellent on the Kokuyo loose leaf paper which I use for review purposes but it dried rather slowly on another Kokuyo note book.